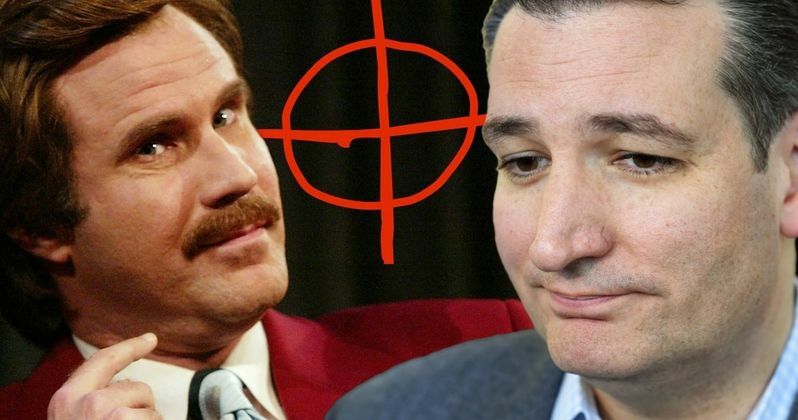 Anchorman spinoff The Ron Burgundy Podcast launches its first episode and claims that Ted Cruz is the Zodiac Killer. The notorious Zodiac Killer operated in Northern California in the late 1960s and early 1970s, killing at least five people and leaving two survivors. He corresponded with law enforcement through cryptic letters and clues, which were often encoded with secret messages and claimed that he had actually killed thirty-seven people. Eventually, the letters stopped coming and the killer was never caught. The story of the Zodiac Killer has been attempted in several books and in David Fincher's 2007 movie, Zodiac. Since the killer has never been caught, there have been a number of rumors over the years, but one of them is a complete joke that started on social media a few years ago, claiming that Republican Texas Senator Ted Cruz is the real killer. Since then, the joke has turned into a meme, which has spread like wildfire, and The Ron Burgundy Podcast decided to go all in on this joke and turn it into a theory. It should be noted that Ted Cruz was born two years after the Zodiac Killer's first recorded murder and that he definitely is not the real killer. Plus, he was born in Canada. However, a lot of people dislike Cruz and are happy to go along with the joke, though Burgundy sounds like he's reading from a teleprompter. He says. "This one is called the Zodiac Killer. A serial killer who taunted the press with bizarre codes that looked like little hipster tattoos. Interesting background for the Zodiac Killer: He was raised in Houston, Texas and he actually attended Princeton and then Harvard Law... and is now working as a senator in Texas." Will Ferrell's Ron Burgundy talks about the 2000 Florida election and the recount, which Ted Cruz spearheaded, only to be interrupted and told that the whole Zodiac Killer and Ted Cruz thing is a made up story from the internet. However, Burgundy chooses not to believe it and then correlates the fact that Cruz went to Princeton and Harvard as making him "crazy." Burgundy also notes that Cruz's wife recently revealed that they cannot buy a second home, clearly poking some fun at the senator. Obviously, Will Ferrell is playing Run Burgundy and does not truly believe that Senator Ted Cruz is the real Zodiac Killer. However, he does make a pretty interesting case for the matter in a very humorous way. Cruz fans might want to stay clear from the first episode of The Ron Burgundy Podcast. On Halloween of last year, Ted Cruz got in on some of the Zodiac Killer "fun" and tweeted out a cryptic message that looked like one of those so-called "hipster" tattoos that Burgundy was talking about. The tweet did not go over so well for some people, who may or may not have told Cruz to do something very inappropriate with feces. You can head over to iHeart to listen to the podcast in its entirety.